If your waterfall or fountain is not providing enough aeration or you wish to keep your larger water garden or small pond open all winter long then these aeration kits are perfect! 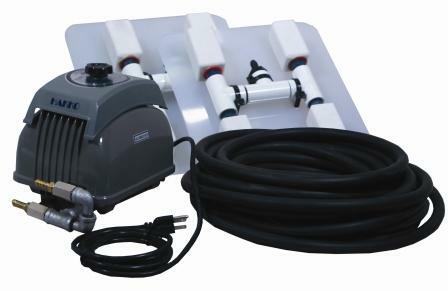 Powered by a silent, reliable compressor, this diffuser system will add oxygen, aerate, circulate, eliminate dead spots and keep your pond and fish active and healthy all year long, costing only pennies per month. Aeration kits include an all weather linear compressor capable of pushing air up to 300 feet to the pond's edge if electricity is not near the pond. Compressors should be covered during winter months. These Airmax KoiAir aeration kits are designed with quality and preformance as top priority. If you are looking for the best water garden aerator on the market, this is it. KoiAir aeration kits are made for outdoor use although a protective cover is recommended. The "Most Realistic Fake Rock Cover Ever" (The AirMax Rock) works great for protecting the compressor and blends into and landscape The AirMax Rock Dimensions are: 17" L x 16" W x 10" H.
Power cord length is 6' 6"
To view the KoiAir Instruction Manual "Click Here"
Winter Fish Kills, They Don’t Float With Us! You’ve waited all Winter long for the ice to melt over your water garden so you can run your waterfalls and enjoy your finned friends. Instead, you find your fish floating at the ponds surface, victims of a winter fish kill. What is this phenomenon and how can you prevent it? When a layer of ice forms over the surface of you water garden, it essentially eliminates any transfer of air to or from your pond’s water. What this means to you is that, as debris decompose and your fish consume oxygen, byproducts are produced in the form of gasses that are toxic to your pond’s inhabitants. These gases are trapped under the ice and cannot escape; fresh air from outside the pond cannot reach the water either and so begins the process of the winter fish kill. Keeping a hole in the ice will allow the bad air in the pond to be replenished with good air. Some pond guys and gals use pond De-Icers to maintain an open hole, but many more rely on their aeration systems to do the job. We’ve discussed in our past blogs the many benefits of aeration in your water garden. It circulates the water in your pond, infusing it with oxygen which is beneficial to your bacteria and fish. The constant bubbling produced by an aeration system will also keep a hole open in your water garden in the winter months, ensuring the release of those harmful gasses. 3/14/2012 – I need a replacement diaphram for my 2 year old Koiair aerator-do you have them in stock? Thanks for your help. 5/9/2011 – What is the minimum aeration would I need for a 11X16 app.2ft deep pond?